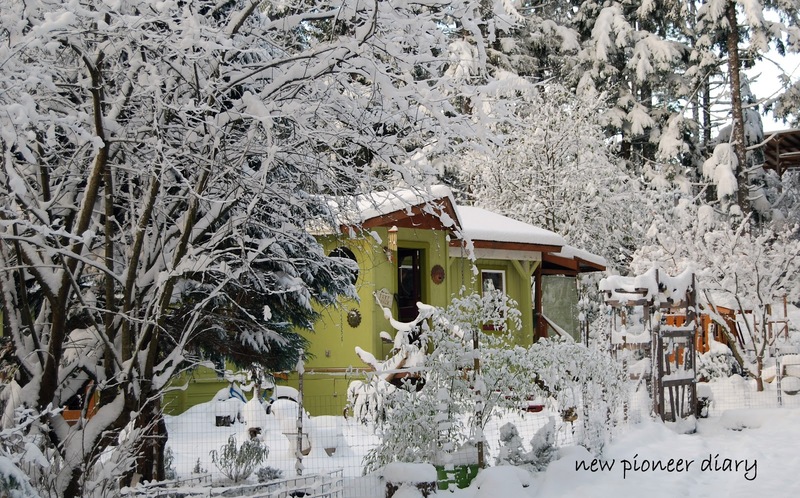 Miss Jeni Gray is a woman of many talents and hobbies with a remarkable mobile home. She actively pursues photography, crafting, poetry, blogging and on top of all that she is a complete do-it-yourself enthusiast. She has produced books of her beautiful poetry. 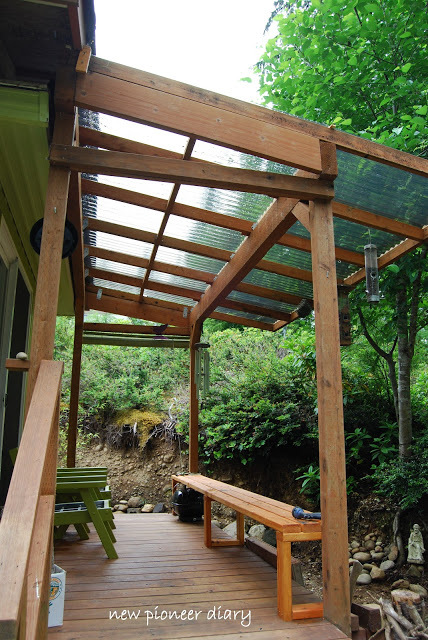 Her homestead is a Certified Backyard Wildlife Sanctuary, recording sightings of birds that visit her in the Northwest, for tracking ecological health. Jeni lives her very active life all while being as environmentally neutral as she can. Miss Jeni Gray’s blog, Huckleberry Hollow, is refreshingly light and informative, chronicling her hobbies and thoughts in a well written and friendly style. Her uniqueness and wisdom easily lures the reader into her world. Her home does the exact same thing. Most people are scared to use color on their homes exterior, not Miss Jeni Gray! The exterior is painted a gorgeous muted green that goes well with practically any color. 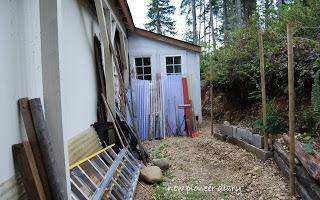 A naturally creative person, Jeni up-cycles objects into beautiful, useful ones and that is exactly what she has done with her single wide mobile home makeover. With her artistic creativity her home has become a remarkably unique and self sustaining environment. “The history of this place is interesting. The first owner (at this location) told me that it was rescued off Mt. St. Helens after it blew in 1980. Later a vacation home, and then purchased and moved here in 1998, onto a newly cleared lot. 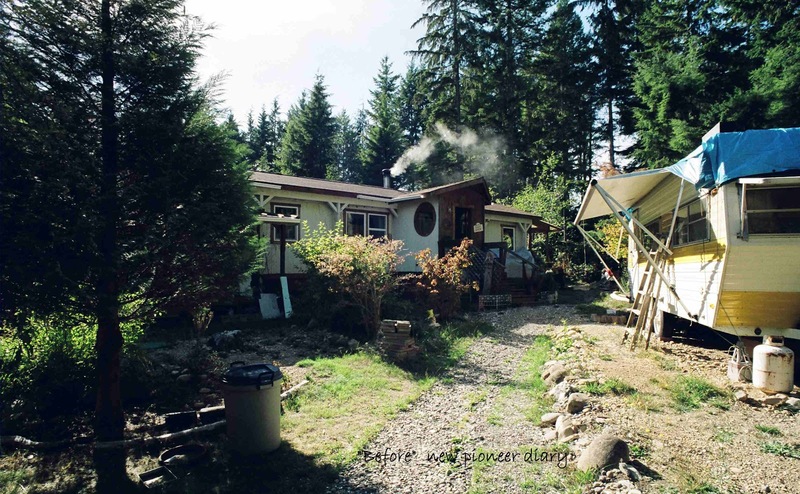 Adding new water lines, electrical, and septic, as well as the full roof-over structure, upgraded electrical and all new appliances, including a water heater and wood stove. 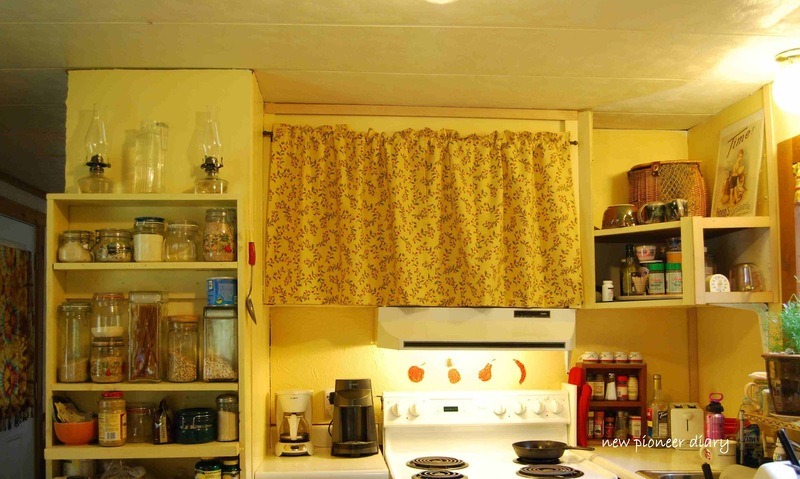 Then she proceeded to have all the windows retrofit with double pane vinyl, sliding door added in the dining room and covered deck off that. 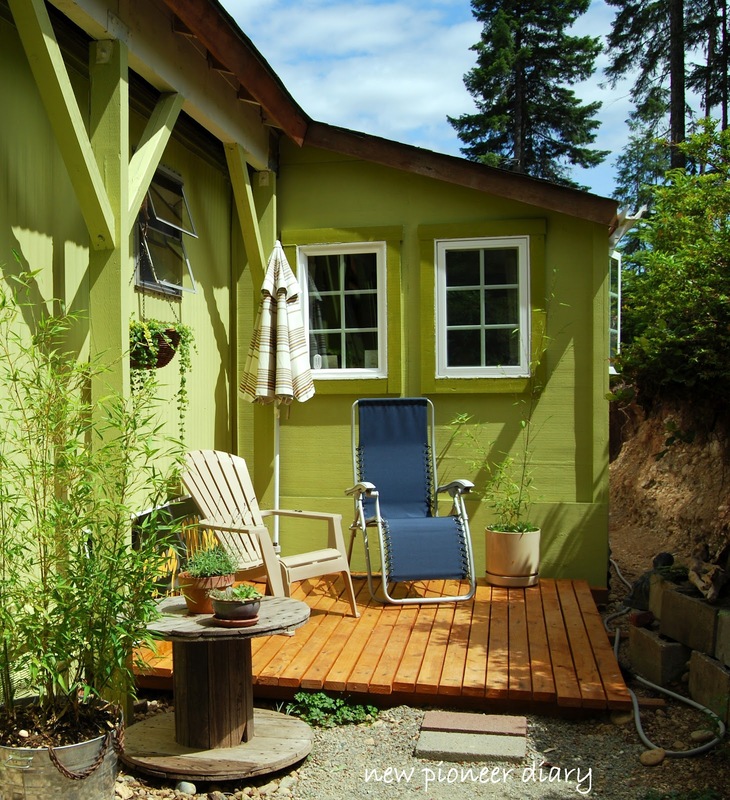 In 2005 the second owner added a 9 x 25 addition along one side, which enlarged the living room and added a small bedroom. “So by the time I bought it mid 2006, the hardest part was done, which was perfect for me because aesthetics is my favorite area of expertise. I nicknamed it Retro Retreat, because it just felt like a step back in time, with the privacy of a retreat. “I have done all the painting inside and out, imported gardening soil, landscaped and fenced the inner yard. I also built a firewood shed close by and added a privacy deck area. “I finished a lot of things, like trimming out the windows, and siding the addition along with installing skirting there. On my days off in winter I enjoy being in my cozy office / craft area near the wood stove. I work on my part time business in photography art, creating greeting cards and promoting my images online. I also enjoy sewing and creating things from recycled fabrics. I love to write as well so I maintain two blogs and create poetry. “In late Spring, Summer, and early Fall I play out in the yard on those same days off. I am an avid bird watcher and track and document all my sightings here. I have registered the property as a Certified Backyard Wildlife Sanctuary. We have bobcats, cougars, and coyote here, so one has to keep an eye on their pets. Two years ago one of the young bears pushed over my fence and tasted all the bird feeders!! My future goals here will be to maintain my vow of sustainability as best I can by keeping a vegetable garden, and respecting the environment with a small carbon footprint. Doing all her own updates and remodeling says a lot about Jeni. Independent and intelligent, conscientious and creative, she has an eye on aesthetics. She knows what is visually pleasing and her color palette is bold yet she does not over power. She knows how far to go keeping clear from over stimulating. A talent not all have. Her blog is just as pleasant as her home. To have such a self sufficient and environmentally friendly lifestyle is a goal of mine and Jeni embodies it gracefully. Jeni is a true pioneer and she is a natural teacher. I thoroughly enjoy every post she writes and look forward to the next one. Her topics range from making scarfs from t-shirts to wildlife study and from tips to buying a car to updating a kitchen. There’s a personal bond you get from her writing and she uses that to teach you but never preach to you. Please join us tomorrow for Jeni Gray’s MHL interview. You will see more great photos and learn more about her and her home. Until then, go over to Huckleberry Hollow and read the informative and intelligent posts about her home and her lifestyle along with beautiful poetry and insights. 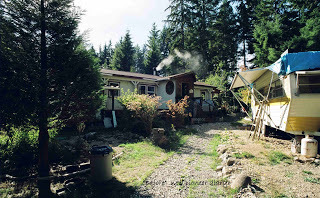 Thanks so much for reading Mobile Home Living. Please like us on Facebook, follow us Twitter and tell your friends about us. Thanks so much! 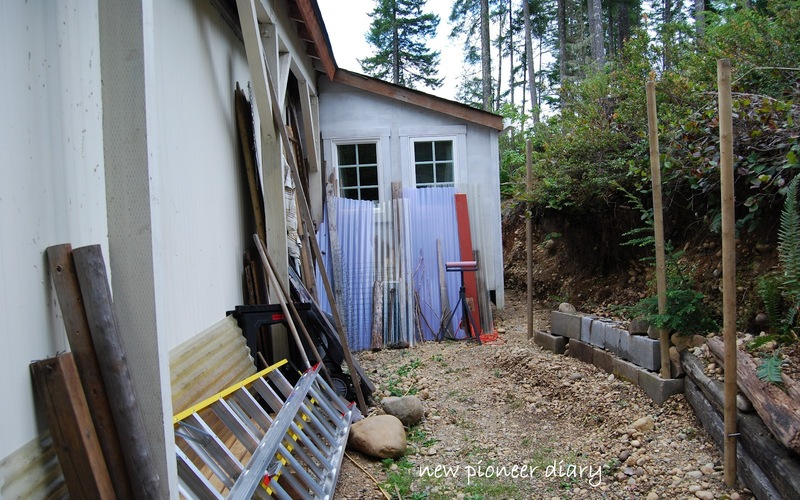 All photos are the sole property of Jeni Grey and the Diary of the New Pioneer. Well……..I have just moved into my first mobile home and I have to say, its been an eye opener. The home is from 1989, and is in semi-good condition, I am renting, before I buy, to get a feel for it first, and to make sure all is working well. I wish there was more info on decorating a mobile home, like a monthly magazine maybe, that would be great! Love Ms. Jeri Gray’s home, she is sure a clever gal, hope we get to see more. This is the first and only thing I have ever came across for folks living in mobile homes. Thank you, Crystal and Miss Jeni Gray! I look forward to reading more of MHL and Miss Jeni’s blogs!! !